Today, the grove series of sensors, actuators, and displays have grown into a large family. More and more grove modules will join the whole Grove ecosystem in the future. We see the Grove helps hundreds of thousands of makers, engineers, teachers, students and even artists to learn, to make, to create...We always feel it is our responsibility to make the Grove module compatible with more platforms. Now we bring you the Grove Base Hat for Raspberry Pi and Grove Base Hat for Raspberry Pi Zero, in another word, we bring the Raspberry Pi the whole Grove System. The Grove Base Hat for Raspberry Pi provide Digital/Analog/I2C/PWM/UART port to meet all your needs. 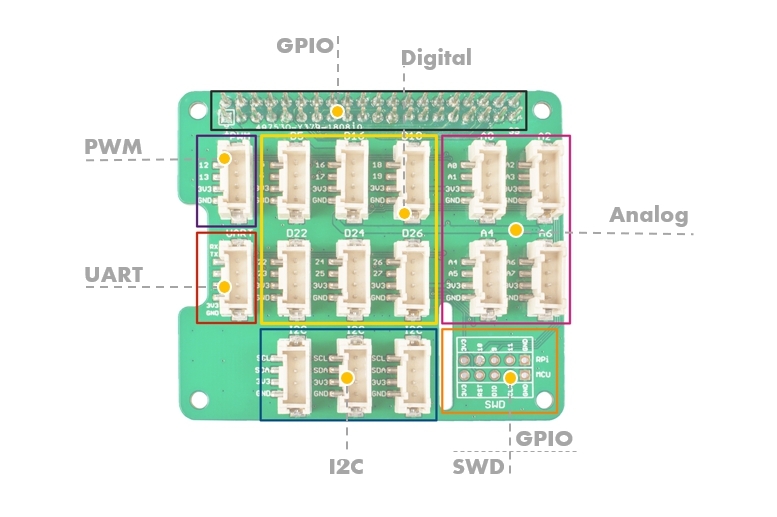 With the help of the build-in MCU, a 12-bit 8 channel ADC is also available for Raspberry Pi. Currently, more than 60 groves have supported the Grove Base Hat for Raspberry Pi . In addition, we will continue to add new compatible modules to the compatible list, the more you use, the more grove will be added. This hat do not contain a Raspberry Pi, the second picture is just a connection diagram. If you need one, you can click Raspberry Pi. Hi, is it possible to stack this Base Hat ? i.e. use multiple HAT on single PI ? Great new product, I would like 1000 if you can show me drivers for Windows 10 IoT Core please.